Our first day in Bordeaux ended with dinner at Restaurant L‘Estacade. The restaurant is situated right on the water of the Garonne river and the view of the city of Bordeaux across the river is magical. We had a pre-ordered dinner (by Annette Schiller) with petits châteaux wines. There are thousands and thousands of petits châteaux. They make inexpensive but very good wines. It’s easy to forget what a huge wine producing area Bordeaux is – as an appellation, it produces more wine than the whole of Australia. These petits châteaux can struggle to make their voices heard on the market. 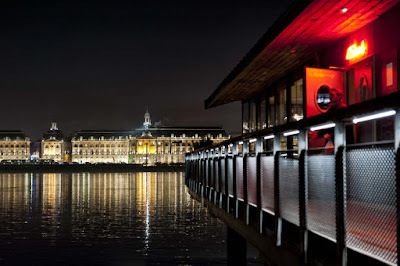 Tom Cannavan (Tom Cannavan‘s Wine-Pages.com): Across the River Garonne (an easy stroll) and built on stilts over the water with amazing views of the city, the food doesn’t need to be good, but is. Respectful, but fusiony cuisine. Decanter - Insider‘s Guide to Bordeaux City (written by Véronique Sanders of Château Haut-Bailly , Pessac-Léognan, in 2014): For me , if I am looking for a relaxed atmosphere I go to Gravelier for its modern cuisine and delicious menu du jour, or La Brasserie Bordelaise for its foie gras and fine grilled meats. Other favourites of mine include L’Estacade on the right bank of the Garonne, looking across the river to the Place de la Bourse, La Tupina for the typicity of its regional cuisine, L’Univerre for its wine list and Le Petit Commerce for its selection of fresh fish. These are some of my long-time favourites, but there are also many new and inventive restaurants opening in the city … Garopapilles, a wine shop and restaurant, is the new project from our former chef, Tanguy Laviale, offering fine cuisine in an intimate setting.